Bottle water is costly and sometimes it can be wasteful. The reason for this is that most of the bottled water consists of tap water, which is contaminated with various toxic elements. However, you can get fresh and clean water by installing an Undersink water filter system. To add to the fact, the installation procedure is very easy-to-follow. So, let’s have a look at the installation process of an Undersink water filter system. Following is a complete step-by-step process for installing an Undersink water filter system. Keep in mind that I have used the Filtrete Water System to let you understand the whole installation process perfectly. Find or make a Faucet Hole: First of all, you have to locate the faucet hole. Generally, the Filtrate Water System works perfectly with the pre-existing holes in the stainless steel or porcelain sinks. Additionally, you will see a lot of sinks have extra holes for the soap dispenser and spray guns. Now, if the stainless steel sink doesn’t contain a hole, you will need to make a hole by drilling. Besides, the drilling procedure is very easy with the right tools and you should remember that you need to make a hole of seven or eight inches to fit the water filter system properly. Install the Faucet: In the next step, you will put the faucet along with the blue hose into the hole. In addition to this, there is a stainless steel fitting on top of the sink and you have to use two washers (which are in between the faucet) before hand tighten the nut to keep the faucet to the sink. Turn off the Water Supply: At this moment, you have to turn off the cold water supply and also, you will remove the cold water hose from the wall to the sink. Spout the Water System: The water filter system is provided with 1/4″ However, a 1/2″ fitting is needed and for this reason, you will get a couple of adaptors from the hardware store. Now, you will just attach the splitter to the cold water pipe and after that, you will push the cold water hose in the white plastic tubing. 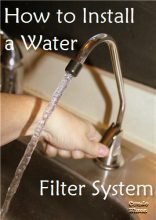 Install the Filter: You can install the filter in your preferred place under the sink. After installing the filter, it will be attached to a filter holder by two screws. Remember that you have to keep at least two inches space below the filter. It will allow you to change the filter in every six months. Connect all the parts: In this stage, you will connect the white tubing from the cold water to the filter holder. Additionally, the blue tubing will be connected from the faucet to the holder. Search for Leaks: This is the last step where you will turn the cold water supply on. Besides, you will check for leaks and press down the lever or pull it up to keep water flow in optimum condition. Be mindful of the fact that you need to let one or two gallons of water before drinking water from the water filter. I agree that bottled water can sometimes be expensive. I want to try to be as water conscientious as possible. Hopefully, the installation process is as simple as you described. How long would you say it would take?